Now we’re talking. I don’t often consider a “technically” second film in a franchise better than the first. In fact, I almost never do that. When I saw Manhunter, I honestly didn’t know what to expect, but I was hoping Hannibal’s character was so strong that it didn’t matter who played him as well as he played him well. Now, Brian Cox did an interesting job in the role, but it didn’t feel like Hannibal to me. Now the master steps to the plate, Mr. Anthony Hopkins. The Silence of the Lambs may not technically be a sequel, because Anthony Hopkins stars in a remake of Manhunter (Red Dragon), but whatever the case, the man can pull it off. Jodie Foster plays Clarice Starling, a trainee for the FBI, who is sent to Hannibal Lecter (Hopkins) for help in solving a new serial killer case involving a man that for some unknown reason, skins parts of his victims when he is finished with them. Lecter hasn’t been talking to anyone, but the FBI thought a young woman would get Hannibal’s motor running, and it does. Hannibal agrees to help out Miss Starling in return for personal information about herself. The more information she gets, the more Hannibal comfortably digs into her skull, making a home for himself. Where to start, where to start. Hannibal’s character in itself is such an interesting specimen. Part of you really wants to see the series change things up and have Hannibal out of his cell, to see him in action. Part of you wants to see how unrestricted he really is in that cell. When “incapacitated”, Hannibal is just so deceptive and manipulative to the point where you are the one feeling behind bars. That’s magnificent. His power stretches out to whispering to the person next to his cell, manipulating his cellmate into killing himself. That’s power, and only Anthony Hopkins can pull it off that way. Anthony Hopkins, in my opinion, does far better of a job than Brian Cox could ever hope to attempt. That slow-talking, conniving, eye-piercing into soul, soulless character fits Hopkins perfectly. His performance is outstanding and across from Foster is also quite remarkable. Jodie Foster plays the perfect rookie agent and looks so small while performing with Hopkins. Not because she is, but because he makes her look inferior. When she is away from Hannibal, Clarice thrives on her own as she investigates the Buffalo Bill case. The Buffalo Bill case is just as interesting as Hannibal for once, and Ted Levine is excellent as the insane body-suit wearing fiend. A lot of the case that surrounds him was thrilling, scary, and disgusting where it needed to be. The ‘gross’ factor in this film is outstanding, and not because of what you see. You don’t see much. I happened to be eating lunch during the autopsy scene, and it was just the tone of the scene that made my stomach quiver. I sat through the Saw Collection just fine, and even ate lunch with those…but there was just something about the darkness of this film that really got to me. I’m not even mad, that’s power over me, and that’s what I want to see in a movie. The Silence of the Lambs is truly the first Hannibal Lecter film in my eyes, and even though Manhunter introduced the character, I really feel as though Anthony Hopkins made it his own, and made it a character you can love-to-hate. It’s that kind of character that had audiences begging for more, and Hopkins returning for the role two more times. Nice review, Dave. 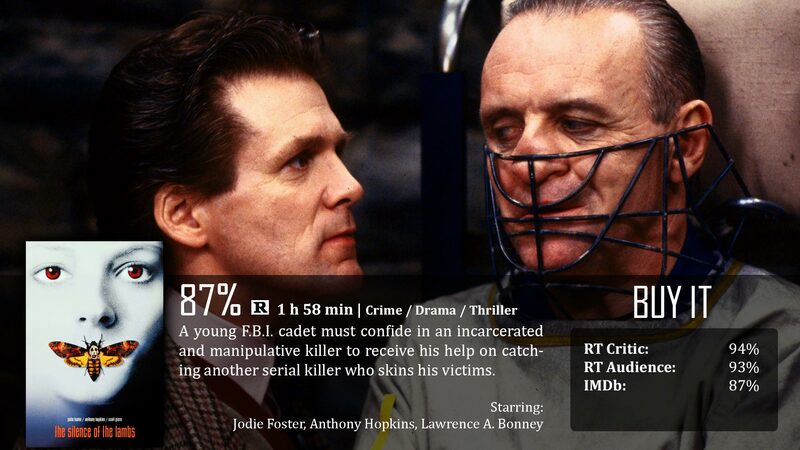 Hopkins’ portrayal of Lecter is one of the greatest performances of all time.